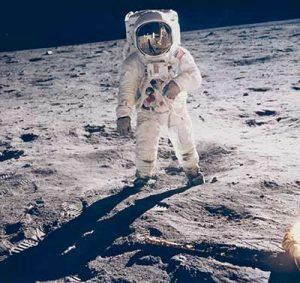 Nearly half a century since Neil Armstrong became the first man to step foot on the Moon, the NASA photographs from the Apollo missions remain as awe-inspiring as when they were first seen. Playing out against a backdrop of Cold War tension, the Apollo programme comprised seventeen missions with the goal of landing humans on the Moon and returning them safely to Earth. Racing for both nuclear weapons and the moon, the USSR and the United States competed to prove their ideological and technological superiority. One of the motivations for photographing the missions was to produce visible evidence of these successful ventures: enduring images for study and enjoyment. The astronauts and scientists involved with the Apollo missions must surely have known they were making history, but perhaps they may not have anticipated how beautiful that history would be, and how cherished. Apollos VII and IX orbited the Earth, whereas Apollos VIII and X orbited the Moon, returning photography of the lunar far side and a series of stunning Earth Rise pictures. This view of our planet from space inspires serenity – a new sense of perspective, of our place in a vast and mysterious cosmos. In this collection of vintage Apollo pictures, silver gelatin prints on fibre paper show us the cratered topography of the moon. Vivid colour prints bring us scenes of the first moonwalk in distinct Kodak hues. These photographs have a timeless appeal and yet are very much of the time in which they were made. Their materiality gives them particular historical resonance – they are physical pieces of history, imbued with the zeitgeist of the era. Apollo XI was the first manned lunar landing. The photographs of Neil Armstrong and Buzz Aldrin on the Moon are some of the defining images of the 20th century post-WWII, a time of rapid technological innovation and social change. The simple yet remarkable photo of Buzz Aldrin’s footprint in lunar soil portrays this first imprinting of the human body on the moon, an event that is etched in our collective consciousness and inseparable from our ideas of America and the Western world in the late 1960s. Later Apollo missions deployed a Lunar Roving Vehicle that allowed astronauts to further explore lunar geology, taking pictures and collecting samples from the Moon’s surface. Among the pictures in this pamphlet we see a man standing on the roof of a car, American flag in one hand and binoculars in the other. His eyes are on the skies, watching the Apollo VIII lift-off, a photograph that in many ways encapsulates the mood of the time.